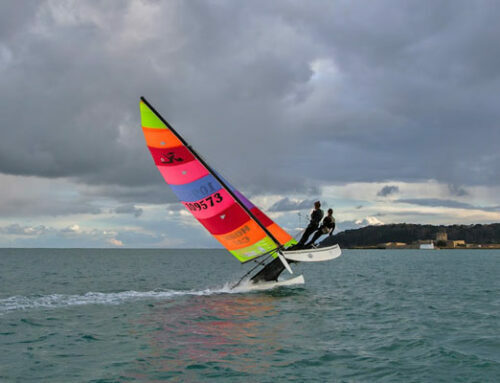 Home/Catamaran News/Sprint 15 News/Sprint 15 40th Anniversary National Championships at Weymouth! With support from an array of fabulous partners – GJW Direct Insurance, Kevin Kirby Limited, Windsport International, Hyde Sails, White Formula, RWO, English Braid – and welcoming longstanding supporters of the Association, including past Chairs and the founder of it all, Ian Fraser, we were all set for a great weekend. And what a weekend it was. Saturday launched the event with GJW Direct Insurance Race Day and time to get into some serious racing. The forecast was not hugely promising (blazing sunshine, blue skies, riviera conditions – but Sprint 15s get nervous if the forecast in anything below 15 knots). However, under the expert supervision of the WPNSA team plus Race Management team of Fiona and Nigel Denchfield and Henry Wright – we were in great hands and got four Championship races in the bag. Following racing, the promise of free drink and cake saw a well attended and brief AGM which is exactly as it should be. Formalities dispensed with, the fleet enjoyed a 40thAnniversary Drinks Reception to celebrate the past 40 years and plan for the next 40 years – courtesy of GJW Direct Insurance – supporting the fleet for the second year. We then adjourned for dinner – followed by a celebration Anniversary cake – ceremoniously cut by John Tuckwell from GJW Direct and Ed Dalton, our Chair. And without entirely crashing an unconnected event being hosted by WPNSA, we enjoyed another beautiful sunset from the balcony. The fleet headed ashore and got glammed up (ish) for the Class Association Dinner celebrating our 40thAnniversary – supported by Windsport International, Hyde Sails, White Formula, English Braid and RWO. Courtesy of Morrison Design Ltd and George Love (current Vice Chair) – a million wonderful memories were relived courtesy of fantastic picture boards sharing events, sailors and boats – both past and present – who make up the fleet’s past and future. We hope we can share these again at a future opportunity. Nigel James – for sailing three whole days without capsizing – defying all known precedent but sadly depriving the RNLI of further donations for this weekend at least. To the slight bemusement of Ben and Nikki, we moved through our very personal but highly coveted special category prizes – including Heavyweight (Nigel James), Over 50 (Mark Aldridge), Over 60 (George Love), Over 70 (Stuart Snell) and Youth (Hector Bunclark). The septuagenarians also showed their mettle with Pete Richardson and Stuart Snell winning the Pro-Am trophy. We were delighted to award Tom Gurney, our youngest competitor the Most Improved trophy and his fellow youth sailors Aaron Kirby and Lucy Littlejohn won the Paul Smith Most Persistent Trophy and the 2 Up Cup. And our special 40th Anniversary National category of oldest boat was easily won by Dave Rowe sailing sail no. 378. We then moved into the less important prize categories culminating in Liam Thom – 3rdplace and winner of Races 3 and 4, Jenny Ball – 2ndplace and winner of races 5 and 8 and finally winner of races 1, 2, 7 and 2018 40thAnniversary National Champion – Stuart Snell. Peter2018-07-02T12:46:54+00:00Catamaran News, Sprint 15 News|Comments Off on Sprint 15 40th Anniversary National Championships at Weymouth!